Just like a good table saw, every good woodworker’s shop has a good air compressor at the ready. Whether you’re shooting finish nails into a cabinet, blowing wood dust off your work surface or even filling up the tires of your car, a reliable air compressor is key. So in this post, we decided to research the best air compressors on the market today and evaluate them. Our experts did the homework for you and put together a list of the best air compressors with a short review under each of them. Lightweight, portable, and low price. This air compressor from Campbell has a tiny one-gallon tank and is capable of producing up to .36 cubic feet per minute of air at 90 PSI, to keep up with everything you need to do without the hassle of lugging a bigger unit around. The 25 foot recoil hose makes it easy to get the air where you need it, and it it pressures up quickly, up to a maximum tank pressure of 110 PSI. It weighs less than 13 pounds, so you can carry it without breaking your back, and the pressure gauge is located conveniently to keep you informed on what is happening inside. It won’t work for everything, but it’s a pretty capable unit for such a small package. Not to mention that the price is a steal on Amazon right now. Half the noise, all the power. 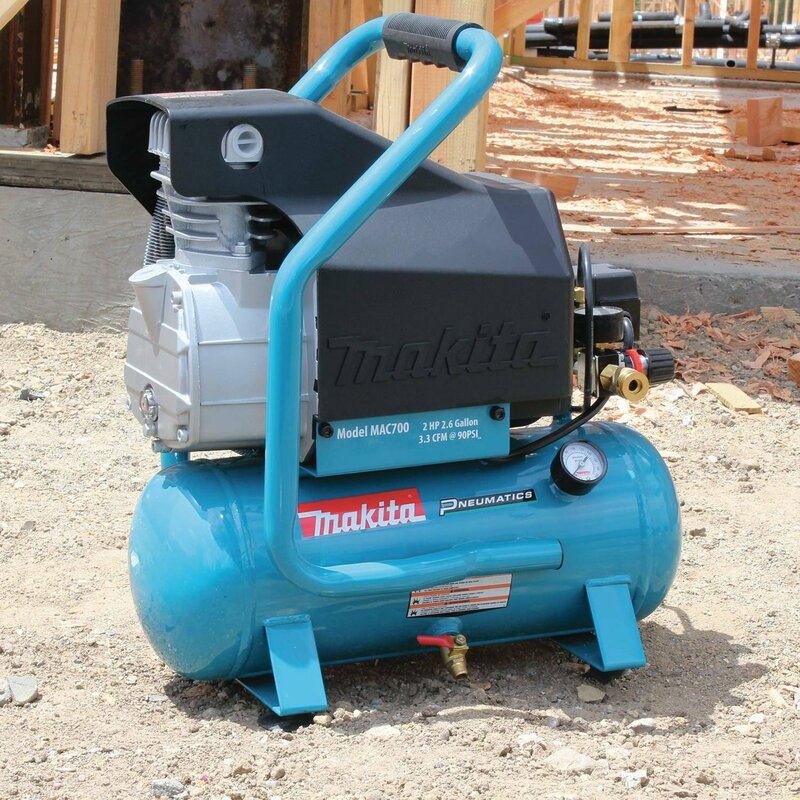 At 68dBA, this air compressor isn’t nearly as noisy as Dad’s old tank, so it won’t blow out your ear drums. The 8 gallon tank pressures up to 125 PSI, to deliver a steady flow of 2.4 cubic feet per minute at 90 PSI. Best of all, it comes with a 25 foot air hose and a 17 piece accessory kit so that you don’t need to fiddle with adapters to get the right quick disconnect. The whole unit weighs 67 pounds, but wheels around pretty easily, and the motor is a powerful 1 horsepower engine. Perfect for light industrial work and use around the house. You’re nail-gun shouldn’t outrun it, but it is designed for home use and not general contract work. For under $200, you’re getting a great air compressor for the money. If your primary uses are going to be filling tires, inflating basketballs, and brad nailing, then you can save some money and still get a very nice air compressor without dropping a ton of cash. This air compressor runs at 60dBA and pressures the steel tank up to a max 120 PSI. Rated for a maximum 2.2 cubic feet per minute at 90 PSA, and will pump 3.1 at 40 PSI. The pump is oil free, using the cleaner air around your house for better efficiency and operation. At 46 pounds, the unit isn’t super heavy, and the big wheels help out when dragging it around. Not a bad deal either right now on Amazon. If you are a contractor, and looking for something a little bigger, this compressor from Porter Cable should get your attention. A good price for a 20 gallon, 150 PSI tank, and it will push 4 cubic feet per minute at 90 PSI, allowing it to keep up with framing nail guns. The upright design, 7 inch wheels, and rubber feet make transport a snap, and it will stow easily in the corner of a garage, smaller shop, or the back of your utility van. Can be used with impact wrenches and for light duty construction equipment, but is still fine for use around the house at less than 100 pounds. The big 1.5 HP motor will keep fresh, compressed air to your tools all day. Beware of indoor use. It’s pretty loud. The best solution might be a longer hose. We’re big fans of Porter Cable products here at Wood Tools Guide and this compressor is a fine example of a great product from a very reputable company in air tools and equipment. For the money, you can’t go wrong. A high quality, incredibly powerful 2 HP engine strapped to a tiny tank, and one-handed carry make this a pretty amazing little portable air compressor. The engine is efficient, enabling low amp draw and tolerable noise levels. You wouldn’t expect a 2.6 gallon tank to maintain 3.3 cubic feet per minute at 90 PSI, but this will do it, making it one of the most powerful portable air compressors in existence, and manufactured by a top-quality company. Amazing tank, amazing price, and perfect for the small contractor who needs to stuff it in the back of his truck with a thousand other tools.